You might think you know the best way for your children to brush their teeth, but have you heard about the latest developments? Everyone wants to take the best care of their children’s teeth that they possibly can. But did you know there’s a new way to improve the way your children brush their teeth, leaving them stronger and more able to resist decay? Fluoridated toothpaste is one of the best ways to protect your children’s teeth — and yours — from decay and erosion. Teeth decay when their outer layers, the enamel, are attacked by acid, caused by the bacteria living in everyone’s mouth. When the bacteria have sugar to feed on, they multiply. This sugar comes from the high levels of sugar in an everyday diet and from other sources, such as starchy foods, and increases the acidity of your mouth and leads to softened teeth and cavities. So the eating habits of your child are very important for keeping your child’s teeth healthy. Fluoride works in many ways. In children, it can make changes to the structure of the teeth, making them stronger and more resistant to decay. Although this resistance is very helpful to the overall health of your child’s mouth, they should never be allowed to eat or lick toothpaste from the tube. Always make sure they spit out excess toothpaste rather than swallowing it. In adults, fluoride helps to remineralise the teeth after acid erosion. It also reduces the ability of the bacteria present in the mouth to create acid, meaning your teeth are exposed to less. What Is the Dry Brushing Method and Why Should We All Be Using It? Dry brushing is a new technique created by dentists and is the best way to expose your teeth to increased levels of fluoride. It is simple and effective, suitable for all ages, and doesn’t require buying any new dental equipment. To brush your teeth with the dry brushing method, first you should add your toothpaste to your normal toothbrush — but add it without making your toothbrush wet. Normal toothpaste should be fine for almost all of the family, so long as it has a normal level of fluoride (between 1350 and 1500 ppm), but if you are unsure, ask your dentist for advice. You should brush your teeth twice a day as recommended by your dentist, but don’t be afraid to brush more if you feel that you need it. Brushing your teeth after eating sugary foods quickly decreases the ability of bacteria to soften your teeth, protecting them from decay. Wait at least 30 minutes with brushing when you had foods or drinks that contain acid (like orange juice and soda drinks), since this can actual lead to tooth erosion. It is especially important to brush your teeth when you wake up in the morning, as your reduced saliva flow overnight gives bacteria the chance to grow. Use your dry toothbrush to apply toothpaste all over every surface of your teeth before starting to brush. Make sure you brush every surface of your teeth thoroughly. What many people don’t realize is that the two-minute brushing time is a minimum, not a maximum. You should clean your teeth for at least two minutes, but longer if they don’t feel clean at the end of that time. If you are brushing your teeth roughly, and if your toothbrush is wearing out sooner than you think is normal, see your dentist. They may suggest that you switch to an electric toothbrush with a pressure sensor. Aggressive brushing can erode the surface of your teeth. When you feel that your mouth is clean, spit out the excess toothpaste and clean your brush. Don’t rinse your mouth. Allowing a layer of toothpaste to remain on your teeth after brushing increases your teeth’s exposure to the fluoride. This makes them stronger and more able to withstand decay. 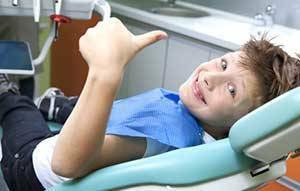 It is important that your child visits the dentist regularly, starting in the months after their birth. Many parents assume that they should wait until the child has a full set of teeth at around three years old. By then, if there are any underlying problems, it is far harder to treat them. Your dentist should be able to give you the best advice on caring for your child’s teeth, whatever their age. You should also be visiting the dentist regularly. Dentists can help you to break out of any dental bad habits that you have formed, as well as giving you advice and checking that there aren’t any underlying issues developing in your jaw. Check out this Infographic on how to brush your teeth.